The Roberts Spray has been built to a high standard and is a credit to the builder. 'Blue Chip' has won numerous Spray Regatta awards. She has a great engine, furling Main, headsail and stay sail. The Pilot house is fitted with a great galley, saloon and helm station. Below, the Midships cabin has a large bed for the Captain and his mate. The V berth is large with twin singles and heaps of room to change. The Bathroom and separate shower are comfortable and also have a washing machine. This boat has everything you will need from AIS, VHF Radio, Self tacking, Bow and stern thrusters. Want to go cruising the coast or live aboard, then this is the boat. Full integral 16mm to 20 mm plate filled with lead and tar. 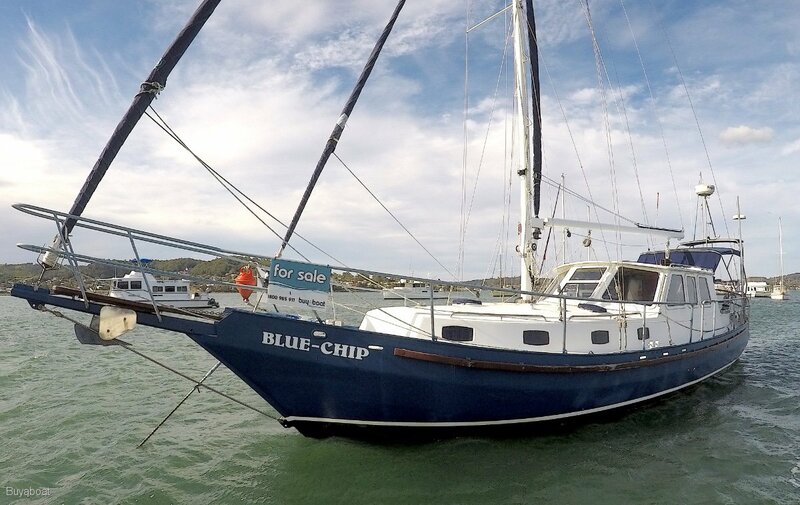 Galley in pilothouse port side aft, Heller Electric oven with two hot plates, Sharp Microwave, generous cupboard and storage spaces, galley table seats 4. Waeco upright fridge 120 L, old top load fridge can be used as ice box. V berth to generous single berths, midships cabin large, comfortable bed. Separate shower with hot and cold water. Electric macerator, with hand basin and cupboard space. Washing machine. Palsonic 20 " widescreen in saloon, Pioneer FM radio. Full cockpit shade, some hatch covers. Muir electric winch with 60 m chain, large plough anchor, fenders and lines. 4 inflatable life jackets plus others, EPIRB, Dan boy, life ring, 2 fire extinguishers, 1st aid kit, torch, flares. Large amount of batteries in 3 banks, one for the anchor and bow thruster, one for the stern thruster and engine, the other for the house and inverter, 2x 60 W solar panels, shore power rigged. Wind generator (not fitted). Raymarine Autopilot with remote, Raymarine chart plotter, sounder and radar, Raymarine AIS VHF. Furling main 95%, Furling and self tacking headsail 95%, furling stay sail 95%. 4 self tailoring winches in cockpit, 2 winches on mast. Boat mooring hook, swim ladder, outboard motor bracket. 'Wow' a great boat with heaps of extras. She needs an antifoul and it's next adventure. The last survey in 2016 says "The Roberts spray has been built to a high standard and is a credit to the builder".